Provides insight into U.S. and Chinese involvement in aid, trade, direct investment and strategic ties in Latin America In recent years, China has become the largest trading partner for more than half the countries in Latin America, and demonstrated major commitments in aid and direct investment in various parts of the region. China has also made a number of strategic commitments to countries like Nicaragua, Cuba, and Venezuela which have long-standing policies opposing U.S. influence in the region. China, the United States, and the Future of Latin America posits that this activity is a direct challenge to the role of the U.S. in Latin America and the Caribbean. 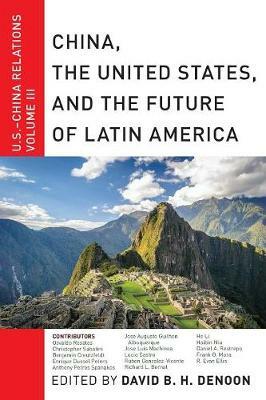 Part of a three-volume series analyzing U.S.-China relations in parts of the world where neither country is dominant, this volume analyzes the interactions between the U.S., China, and Latin America. The book series has so far considered the differences in operating styles between China and the U.S. in Central Asia and Southeast Asia. This third volume unpacks the implications of competing U.S. and Chinese interests in countries such as Brazil and Argentina, and China's commitments in Nicaragua and Venezuela. This volume draws upon a variety of policy experts, focusing on the viewpoints of South American and Caribbean scholars as well as scholars from outside states. China's new global reach and its ambitions, as well as the U.S. response, are analyzed in detail.A nuanced examination of current complexities and future implications, China, the United States and the Future of Latin America provides readers with varied perspectives on the changing economic and strategic picture in Latin America and the Caribbean.